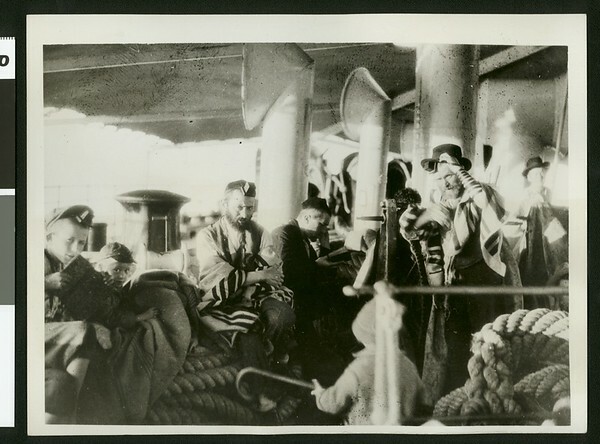 Photograph of a group of davening European Jews aboard a ship on their way to South America. " | Watch your credit | International Newsreel Photo | Slug (group on deck) | Jews of Europe off for their new Promised Land | New York... This most interesting picture was made on a ship bound from Europe to South America and shows a group of Jewish immigrants bound for their new Promised Land. Since the United States pladed [sec] restrictions on immigration, the tide has turned toward our South American republics, where thousands of immigrants are flocking to establish their new homes. The Jewish immigrants here are pictured at morning prayer as they invoke the blessing and guidance of their fathers. B-Aug/4/31" -- typed note attached to verso. "Received. Examiner reference library. Aug 7, 1931" -- stamped on verso.